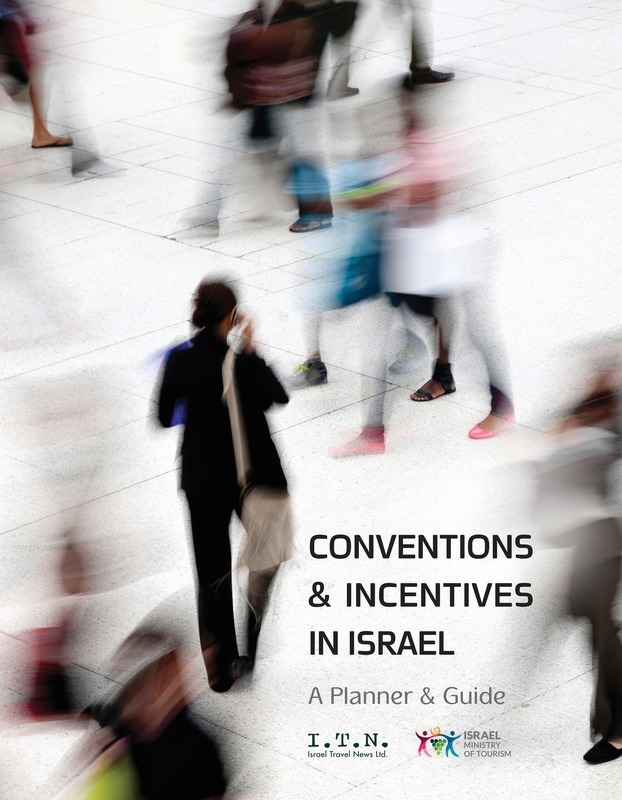 Israel's richness transcends beyond its eventful history, with an evolving catalogue of captivating architecture, outstanding culinary, thriving micro-cultures, high tech centers and agricultural wonders. From the peak of the north to the depths of the south, the compact country boasts a diversity of regions, bursting with distinctively unique characteristics and the opportunity of luxury experiences. With the Jewish holidays clearing a gap in the calendar, I switched my desk for the road to venture on an exploration of indulgent discoveries. Approximately 35 kilometers south of Haifa, at the southern end of Carmel Mountain, overlooking the Mediterranean Sea, is Zikhron Ya’akov – a small town with a big history, notably on the subject of Israeli winemaking. 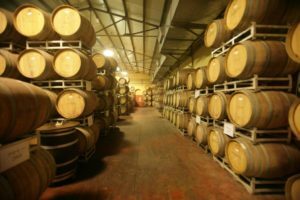 With over 13,500 acres of wine vineyards providing grapes to Israel’s 40 wineries (and 250 boutique wineries), Zikhron Ya’akov has become an historical region renowned for its wine production. Carmel Winery is the largest wine producer in Israel, with roots dating back to 1882, the time of the region’s founding by Jewish Romanians. The area became prosperous after a visit in 1887 from Baron Edmond de Rothschild, a banker from Paris and owner of Bordeaux winery Château Lafite. In 1895, Carmel Winery became an exporter of wines produced from its Rishon LeZion and Zikhron Ya’akov wineries, built in 1890 and 1892, respectively, and to this day the winery remains Israel’s largest exporter, with 15 million bottles produced a year, around 15-20 percent of which are sold internationally. The company is symbolic to the land of Israel and holds prestigious significance in that it once served as the workplace for three Israeli Prime Ministers – David Ben-Gurion, Levi Eshkol and Ehud Olmert. The winery maintains much of its original charm and houses a small theater, showcasing a film on the country’s wine industry (offered in English, Russian, Chinese and Hebrew); the vat room, with lines of refurbished cement tanks, and grand private tasting room. A personal highlight was venturing into the underground cellar, an atmospheric space with low lighting and rows of old piled barrels. Across from the main building is the Carmel Wine & Culture center, which was established 10 years ago as an extension of the historical barrel room, delicately merging present day appeal with decades of history. I gathered around the central wooden table in the Carmel Wine & Culture center to taste a rainbow of wines and assess my connoisseur abilities. The Appellation Gewurztraminer 2016 – a semi dry white wine made from grapes in the Judean Hills vineyards, is aromatic with a hint of sharpness. The 2015 Ha’Nadiv Valley red, from the Private Collection, provided fruity underlying tones; whilst the 2003 Mt. Amasa from Yatir Winery in Arad – owned by Carmel Winery – is more immediate and intense in its flavors. “This wine is aged for approximately one year in a small oak barrel and sold after two years of additional aging in the bottle,” explains Hecht. The front-runner is the 2 Vats Rose, a 2016 dry wine blending fruity notes of strawberry and red grapefruit, a divine companion for a sun soaked afternoon. The wine was the recipient of the gold medal and trophy for the 2016 Citadelles Du Vin competition in Bordeaux, a deserving champion. Carmel winery offers around four tours per day, five days a week, from experienced guides within the industry. “We cater to a wide market, both incoming and domestic, with a lot of guests from North America, China and Europe,” outlines Hecht. Tours include a one hour classic tour and tasting and an extended workshop tour, featuring a visit to the barrel sites and private tasting experience, accompanied by locally produced cheeses. In 1882, the Tishbi family was commissioned by Baron Edmund de Rothschild to plant one of Israel’s first modern vineyards. Fast forward to 1984 and Tishbi Winery was inaugurated by Jonathan Tishbi and continues as a family run enterprise to this day, traversing decades of experience in the wine making industry. Located between Binyamina and Zikhron Ya’akov, the site produces one million bottles of wine a year, 20 percent of which are exported. I take a seat at the high top square bar to sample from a selection of wines. “Our grapes are sourced from all over Israel, from Sde Boker all the way to the Golan Heights, all of which have the best vine-growing conditions,” explains Oshra Meltzer, office manager and public relations and export management at Tishbi. I smell and swirl the 2012 Estate Cabernet Sauvignon before taking a sip. The 12 month aged wine reveals a mixture of fruity notes and a light sweetness. This is followed by the 2012 Malbec, a single vineyard wine with a sharper aftertaste. “When grapes are picked from a single vineyard, the taste is isolated as the fruit has grown from the same soil. You can really taste the difference.” I also taste the Ruby Cabernet, a 2012 plum colored wine with a powerful aroma, which is subtle on the palate. Tishbi is the official importer of luxury French chocolatier Valrhona and has an exquisite display of treats from the company’s extensive catalogue, all of which encompass a distinctive flavor: The Abinao 85 percent offers a fierce intensity of cocoa, a satisfying blend of bitter with a sweeter ending; the Manjari 64, a less tart concentration with a fruitier flavoring; and cream Blond Dulcey, a heavenly mélange of biscuit and shortbread in one extravagant bite. Aside from the winery, the on-site bakery churns out fresh goods from its own unique combinations of milled flour. The welcoming smell allures you in, where you can watch the rising bread bake in the imported wood burning oven from France. Additionally, Tishbi has a kosher dairy restaurant with a breakfast and lunch menu, and an American style food truck which caters a barbeque every Friday. We move to the restaurant for lunch, prepared by Austrian master chef, Gunther Biedermann. Perched on a bench in the outdoor porch, nuzzled beneath a canopy of intertwined vines, I pour over the menu, extensive and well thought out across a choice of starters, pizzas, pastas, fish dishes and salads. The grilled beer pastry, topped with camembert cheese and a blob of wine jelly, is very special; the triangular cuttings a flawless sweet and savory parcel. The poached asparagus salad is equally as satisfying, with its combination of capers, pickled dill cucumbers, a boiled egg, mint, parsley and chopped shallots, served alongside roasted potato wedge chunks. A basket of the bakery’s freshly baked bread is also served with a spread of gourmet fruit wine Jelly, produced by Oshri Tishbi, daughter of Jonathan, who created her own line of products entitled: “Fine Foods by Oshra Tishbi”. The experience was a harmonious balance of informative learning in tranquil surroundings, a welcoming start to a pampering respite in Israel. 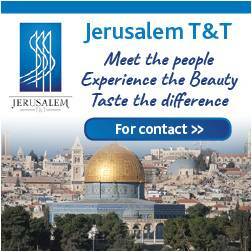 Tours are offered in English, French and Hebrew. Tishbi Winery is open Sunday – Friday. The ancient town of Caesarea is a picturesque region of Israel, founded by King Herod in the first century BCE, located 20 minutes south of Zikhron Ya’akov by car. Having exchanged ownership throughout the ages – from the Romans to the Fatimids, the Crusaders, the Ottomans, the British (under their Mandate of Palestine) and finally to the State of Israel, – Caesarea sits on Israel’s coastal plain and is an area of ancient fascination, archaeological discoveries and a magnitude of activities. We reach the region just in time to explore the unearthed wonders contained within Caesarea National Park, including the restored Roman 100 meter amphitheater, – the oldest of its kind east of the Mediterranean – and the Promontory Palace to its southern end, which underwent excavations between 1990 and 2001. On display are the remains of the hippodrome, a structure rebuilt during the 2nd century AD and in part utilized as an amphitheater for gladiators, as well as the breathtaking remains of the Caesarea Columns, amid a scattering of other ancient remnants excavated during the 1950s and 1960s. The experience is an excellent lesson in history, with tales of bygone eras hinted throughout the entirety of its landscape. 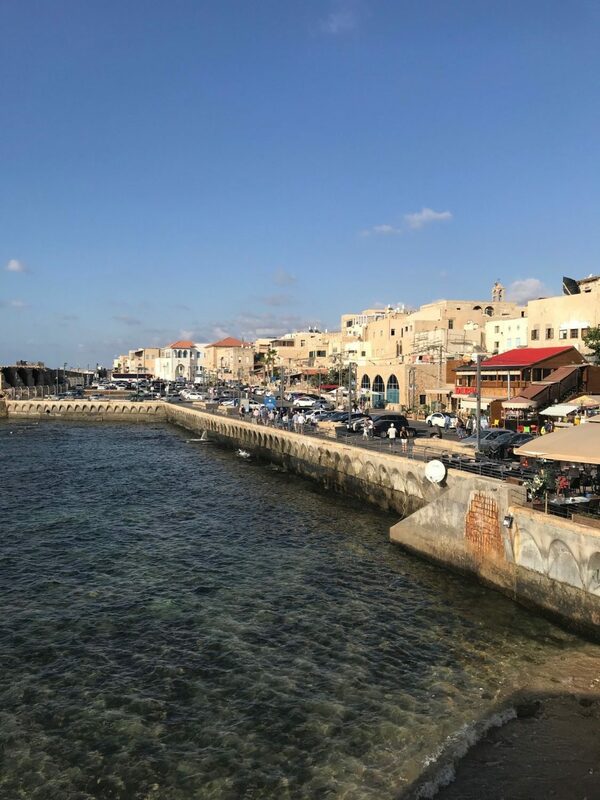 This area extends into Caesarea’s Harbor, lined with quaint galleries and a selection of restaurants, a significantly historical landmark connecting to the sea. 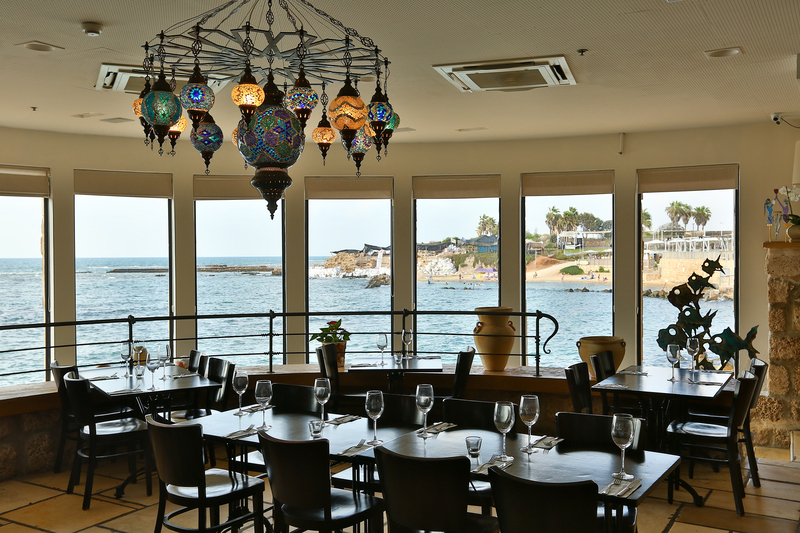 A short walk along Caesarea’s port is Helena restaurant, named after the Greek Goddess, daughter of Zeus and Leda, and a symbol of perfect beauty. The exposed stone décor amid other classical elements unifies with the ancient backdrop, which can be seen across each tier of the restaurant. The owners of Helena, Chef Amos Sion and his partner Uri Jeremias, are both renowned for their outstanding service within the culinary field. Sion’s roots for fine cuisine sprouted from a young age, when he would cook for his family, later entering the study of gastronomy, working among Israeli chefs, such as Yankale Schein and Yonatan Roshfeld and furthering his learning in Alsace Lorraine. The menu infuses Israeli Mediterranean cuisine with tastes from Europe for an inventive repertoire, fashioned from locally sourced ingredients, which are reflective of the season. Darkness has set by the time we arrive and our window romantically captures the reflection of waves in the moonlight. We are greeted by Chef Amos, who warmly welcomes us to Helena, before whisking us off to the kitchen to concoct a special tasting menu for the evening. Our appetizer arrives shortly after – grouper sashimi cured in beetroot and arak, balanced carefully on a stack of herb salad, almonds and smoked eggplant cream, amid a stream of parsley oil. 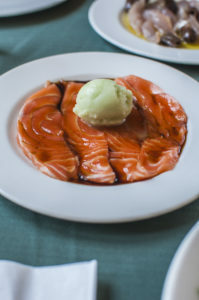 The skillfully cured fish is fresh and the ingredients on the whole are an exhibition in both taste and presentation. A glass of 2015 New Zealand Private Bin Sauvignon Blanc is poured, a powerfully aromatic wine, which pairs well with our first course of smoked pizza bread, topped with drum fish, thinly sliced potato and succulent garlic, prepared in the restaurant’s olive wood stone oven; a harmony of intense textures and rich piquancy. Next on the menu is a red tuna carpaccio plate, topped with a cucumber-anise sorbet, with clusters of tobiko egg, balancing on sliced radishes. The flavors are delicate, a tartness interacting with the cleansing sorbet for a lustful mingling of tastes. Chef Amos’ union of unconventional ingredients is genius, a special component that comes with dining at Helena and an ignition for dinner table conversation. We wash down this course with a local Shiraz from the Galilee, a gentle wine with fruity undertones. Before long, Chef Amos appears at our table, to present a cauldron of baked drum fillet on a bed of Italian riso pasta rice, lathered in porcini sauce, with tender mushrooms and a stem of crispy kale. Dessert was preluded by a glass of Sangre de Toro, from Torres, Spain. A stormy wine, the color of deep cherry, with notes of intense wild berries. A plate stacked with two scoops of homemade tahini Ice cream is brought to us, dowsed in date Syrup, halva threads and melting onto a bed of cinnamon sugar pastry. We attack from top to bottom, pilling each scoop with a helping of layers, allowing the intensity of flavors to settle on the palate – in basic terms, perfection. Like the Goddess herself, Helena is flawless, a distinctive evening of delectable gastronomy to enlighten all the senses. 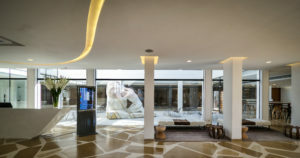 You can’t help but marvel at the silhouette that is the Elma Arts Complex Luxury Hotel, an iconic two-story property built in 1968 by Yaakov Retcher, which curves to hug the land and sea on which it rests. Named the Mivtachim Sanatorium at that time, the building was used for a number of years as a healing facility for Israeli workers, before briefly operating as an Israeli Defense Force base, and then as another hotel – Carmel Gardens – before shutting its doors in the late 1990s. The maze-like corridors double as an open gallery for guests and visitors to explore exhibitions. I find myself by two striking inkjet print paintings from the artist Ilit Azoulay’s “Imaginary Order” series. Spanning two walls, the images utilize a fascinating technique of layering assembled objects, signifying the intricacies of Elma’s renovation. Guests will encounter a tapestry of artistic surprises weaving their way across every nook, blending into a harmony of soothing music that fills the hotel. 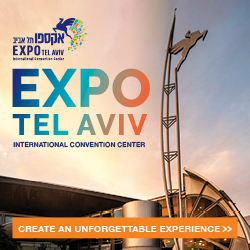 It’s a special experience for both art connoisseur and cultural explorers. The outdoor grounds are a pleasure to amble. There is a small herb garden, outdoor pool and an expansive courtyard full of artistic surprises, including a paint splattered life size aluminum structure of a male, depicted from Sigalit Landau’s “Endless Solution” exhibition. “The walls of each room were built on a platform to offer shade against direct sunlight and create a sense of intimacy as you soak up the sea and fresh air,” explains Shimony. From my viewpoint, the gaps between room pillars sculpt unique frames of the countryside, forming snug hideaways within the bountiful landscape. My accommodation for the night is a Deluxe room, one of eight categories available from the 95 rooms on offer. The 35m² space is a respite of uninterrupted tranquility among a minimalist design approach, synchronized to the hotel’s refined grace. Soft oak furnishings, playful textiles, and an opulent walk-in rainfall shower characterize the space, whilst two separate balconies offer shielded privacy to marvel at the spectacular melding of patchwork fields onto the sea. The next morning I’m seated at Ontario, the hotel’s restaurant run by Chef Gil Aviram, alongside pastry chef Sharon Harel. The restaurant’s bravura is reflected in both its cuisine and design – exposed glass cases of finely stacked local wines, exquisite handcrafted furniture embodying classic brutalist elements and timeless gold furnishings for a dash of understated opulence. The buffet breakfast features a multitude of dishes, conceived of locally sourced ingredients. Counters laden with colorful salads, roasted vegetables, plates of sliced cheeses, a piping hot shakshuka, spreads and dips of every category, cereals and fruits, loaded with tempting cakes, sweet Malabi and coffee prepared to your liking. The showstopper of the morning is the knafeh, a Middle-Eastern shredded wheat pastry, filled with cheese and soaked in sweet syrup. The taste was instantly addictive, a divine union of savory and sweet. Before departing, I take a moment to appreciate the shapes of marble patchwork flooring, perhaps a nod to the network of fields encasing the property; a silent reminder of our delicate relationship with Mother Nature. Our morning commences with a ritualistic immersion of faucet water, followed by a session in the steam room and a massage. “In reality, the Turkish massage does not exist, it’s actually a technique combining hot marble and foam to wash the body,” says Ghattas. “We decided to combine this process with elements of deep tissue, Swedish and Thai massages to pioneer a new product which is gaining popularity throughout Israel.” The result is outstanding – a combination of olive oil foam and luffa scrub, intermittent water dowsing and massage. Much time was spent kneading the knots along my shoulders and spine, and re-aligning the joints across my body. The cultural music quietens any thoughts in my head as every muscle is eased into deep relaxation. “My father can remember the macho games that men would play in the baths, such as towel hitting, and so we decided to incorporate gentler versions of this into the treatment.” Post massage, we are wrapped in warm colorful cloths and proceed to the hot tub. Our masseuse rings a golden bell to signal the opening of a hatch, where a selection of cold drinks await. The morning concludes in the dry sauna and a respite on the central marble bed, a structure which radiates heat across our bodies, lulling us into a moment of mindful meditation. “We originally opened the baths as a public space, but discovered that the process only works by groups having the entire space to themselves,” explains Ghattas. “The space is available for up to four hours and has become very popular for celebrations, families or those on vacation who seek an authentic experience. We are also very proud to have received a certificate of excellence from TripAdvisor this year.” Before departing, we sip on a Turkish coffee, infused with fragrant spices, and enjoy a plate of Turkish cookies, a pleasant closing to an unwinding morning. Ghattas Turkish Bath has already welcomed guests from over 70 countries and can cater for groups of up to 26 people, who receive treatments on a rotational basis. 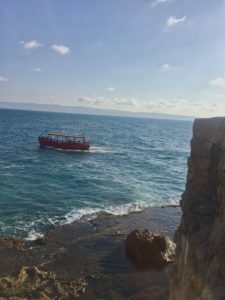 Acre, (also known as Akko), two hours from Tel Aviv by train, is located at the most northern part of the Haifa Bay, one of the few cities whose ancient walls rest beautifully intact against the Mediterranean. Layers of history are present across every corner as a reminder of the conquerors before, from the Canaanites and Romans to the Crusaders, Ottoman Empire and the British. The city’s geographical location on Israel’s northern coastal plain contributed to its continuous development and expansion throughout the ages. The harbor allowed for trade and commercial activity within the region and beyond, ushering in financial growth and architectural development. 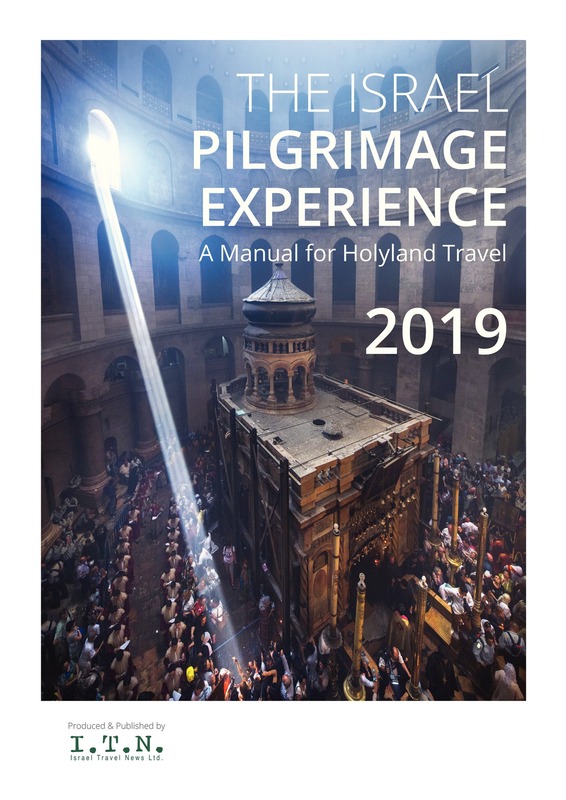 The Old City’s well preserved narrow streets are testimony to this prosperity with baths, churches, synagogues and grand mosques peppered throughout, alongside walls, fortresses and knights’ halls – mostly from the Crusader and Ottoman period. Within the wider area there are approximately 40,000 residents of Acre, with 95 percent of the old city’s population consisting of Muslim and Christian Arabs as well as Baha’is. During our day of discovery in Old Acre, we were transported back in time. We meandered through the small streets and narrow lanes, walking past Israeli Arab school children on their way home, and peeped into the open doors that revealed the homes of the community of Old Acre. We also climbed the Land Wall Promenade, accessible via the stairway, and were presented with spectacular views over of the Old City. Having once served as the only terrestrial entrance to the city, we were in awe of our surroundings. The beauty of the walled entrance to the Old City is matched by the strength of the walls which Napoleon could not overcome in his attempt to take Acre in 1799. Having climbed, we decided it was time to escape the intensity of the sun, to venture underground to explore the street level below. The Templars’ Tunnel, discovered in 1994 and subsequently opened to the public, is 350 meters long having once served as a strategic underground passageway that connected the Templar palace to the port. As we walked along the tunnels, modern day air conditioning seemed no longer necessary, as the strong fortifications provided a welcome opportunity to cool down. Exiting the tunnel, we were faced with the Mediterranean, surrounded by Acre’s southern sea wall with its lighthouse, built on the south-western corner in 1912. This section offers a magnificent view of the ocean below, the reflecting sun bouncing off each wave and harbor boats, including speed boats for the thrill seeker tourist, sailing on by. After an afternoon of walking, we satisfied our hunger with a classic Middle Eastern meze platter consisting of hummus, tahini, eggplant and salad alongside freshly baked pita bread from the nearby Turkish bazaar. For first timers to Acre, the stone-vaulted Knights’ Halls offers an insight into life in the citadel constructed by the Hospitallers. For those seeking religious and architectural wonders, the El-Jazzar Mosque dominates the city’s skyline, with its green dome and winding staircase of 124 steps, influenced by the Byzantine and Persian styles of the Ottoman Empire. All in all, Acre is a city of ancient history, greeted with the rising sun and sea winds from the Mediterranean that wind through the labyrinth of streets and spread the aromas from the Turkish bazaar all around. The history is palpable throughout – below ground, on the street, at the harbor and in the air. Uri Jeremias is quite the enchanting character, strong in stature and sporting a lengthy white beard, his presence permeates throughout the restaurant. It’s 8pm as we saunter to Uri Buri, a few minutes’ walk from our hotel, by which time is brimming with animated diners, clinking glasses over the dinner tables. As one of Israel’s most renowned chefs, Jeremias’ unique philosophy to cuisine has sustained his career across decades, channeling the old school tactic of erudition by experience. He was born in the seaside town of Nahariya, south of Acre during the period of British Mandate rule, where he was enthralled in a life by the sea as an avid fisherman and swimmer. “I guess you can say I’m a son of a beach,” laughs Jeremias, sending our table into a fit of laughter. Five of us are gathered intently around the chef, absorbing his wisdom in fascination. “I never enjoyed school, I was not an outstanding student.” Instead, a recipe of boundless creativity and gut instinct has been a catalyst in leading him to iconic status within the culinary sphere. In 1989, he opened Uri Buri, a humble institution within a 400 year old Ottoman structure, resting on the cusp of Acre’s shore. 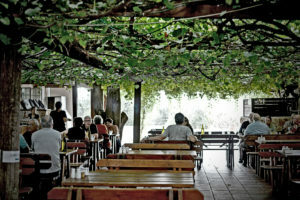 You won’t stumble upon silk tablecloths and extravagant furnishings here as instead the spotlight is focused on the food. Dishes begin to fill the table – a creamy mushroom bisque served in a cappuccino cup, the intoxicating flavors a result of a lengthy boil; bruschetta bites piled with smoked eggplant cream and Spanish mackerel; a plate of freshly sliced sashimi salmon, stained with soy sauce and topped with homemade wasabi sorbet, a revolutionary union of tastes; and caramel baby St. Peter’s fish with sour beetroot, a devilish play of sweet and savory flavors. We sample even more: salmon panko wrapped in Nuri seaweed with fragrant pickled fennel; ceviche of sliced fish, marinated in olive oil, lemon, capers and onions – a simple, yet superb marriage. Finally, the seared tuna with yogurt and olive oil, succulent chunks bursting with zest, enhanced by the sour tang of yogurt; a triumphant experimentation in taste and presentation. The food is a revival of back to basics, ideal for seekers of unfussy dining with a twist. Dessert is also by demonstration in the second of the two kitchens, an intimate space filled with the bustle of diligent staff. Warm sugar water is drenched over the baking Knafe, immersing the pistachios and layers of shredded wheat with a syrupy finish. The treat is offset by intriguing rose and cardamom flavored ice creams and a reviving bowl of kiwi soup – minimalist yet intense in taste. At the core of Acre’s Old City sits the Efendi Hotel, a breathtaking boutique hotel, which resides in a structure dating back 1500 years. During the 19th century, the Efendi houses served as palaces for wealthy Ottomans and were later purchased in 1870 by Uda Hamar, who transformed it into a sprawling family home for his wives, children and servants. Laying abandoned years later, the decrepit building was purchased by Uri Jeremias, who embarked on an eight year labor of love to restore the two adjoining ancient houses to their prior glory. The project, completed in 2012, was painstakingly intricate, following a detailed plan, which adhered to the guidelines of the local Antiquities Authority. The result is quite remarkable, merging an old world charisma with present day appeal. “Each ceiling mural was hand painted by a team of Italian artists over an eight month period, which required the highest level of skill, concentration and attention to detail,” says general manager Roi Samogora. The result is captivating, an assembly of lively flowers, accented by gold trimmings, each room incorporating a unique design. The entire hotel is unified in character, with its palatial elegance evident across many elements: the restored marble flooring, ornamental furnishings, artistic windows and eye-catching wall murals. 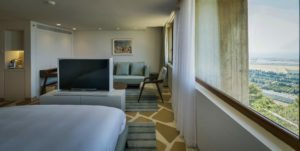 “The whole process of restoration took a lot of patience but the outcome is a one-of-a-kind hotel, which offers a new level of boutique luxury to Israel,” explains Samogora. 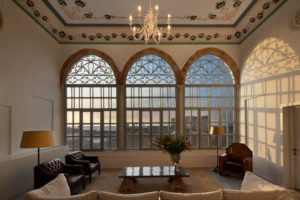 The expansive property has a grand dining room, leading off from the entrance level public lounge; an underground wine bar encased in 900 year old arches and remains from the Byzantine Empire; a 400 year old restored Turkish Hammam and a spa. The open spaces are evocative in design and welcoming features, from an oversized chess board to abundant floral arrangements. The hotel is a paradise of ancient grandeur, a one-of-a-kind property for authentic Middle Eastern immersion. Scouring the property, you feel encased within a story transcending centuries, as if you are residing in a revived palace. Twelve regal rooms exude a distinctive charm of romantic opulence, including Our Presidential Suite, with its exuberant display of high ceilings, lavish furnishings, majestic chandelier and a neutral color scheme; offset by a ceiling of radiant colors. A chic bathtub rests majestically by the back corner window, its floating silver taps and elegant claw-foot legs beckoning me for an afternoon soak, and a succession of rectangular windows draped with fine sheer curtains frame exquisite snapshots across Acre’s shore. The following morning a group of us gather for an intimate breakfast around the spectacular knight’s table. Eggs are prepared to individual order from a delectable menu and are presented alongside a sprawling feast of freshly baked bread, a spread of dips, finely chopped Israeli salad, yogurt with sweet granola and delicate pastry delights. Surrounded by an air of royal elegance, we fully revel in the moment. An unparalleled indulgence within the ancient streets of Acre.